Heat the oil in a medium non-stick frying pan over medium heat. Add the onion and cook, stirring, for 5-10 minutes or until browned. Add the vinegar and sugar and cook, stirring, for 1 minute or until well combined and heated through. Remove from the heat. Meanwhile, place the couscous in a heatproof bowl and pour over the boiling water while stirring with a fork. Cover and set aside for 5 minutes or until all the liquid is absorbed. Use a fork to separate the grains. Add the onion mixture, lentils, parsley, mint, dates, sunflower kernels, tomatoes, lemon rind and juice, then gently toss until just combined. Taste and season with salt and freshly ground black pepper. Spoon the tabouleh among serving plates. Serve with a dollop of yoghurt and Lebanese bread. 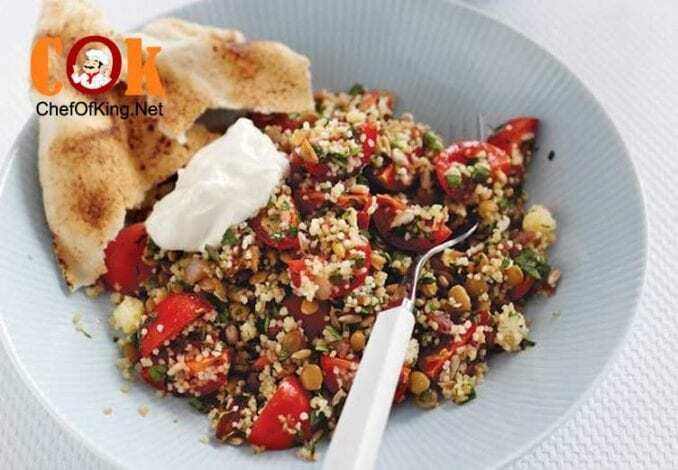 More options Red lentil tabouli with cherry tomatoes: Replace couscous and lentils with 90g (1/2 cup) burghul, soaked in cold water for 20 minutes, drained, and 210g (1 cup) red lentils, cooked in a saucepan of boiling water for 12-15 minutes. Pine nut & raisin lentil salad: Replace the dates and sunflower seed kernels with 55g (1/3 cup) pine nuts and 95g (1/2 cup) flame raisins, chopped. Caramelised chicken & couscous salad: Omit onion. Add 2 chicken breast fillets to the pan in step 1 and cook for 4-5 minutes each side or until cooked. Thinly slice and add to salad with 2-3 green shallots, ends trimmed, sliced.